Taboo or Not Taboo? Forbidden Thoughts, Forbidden Acts in Psychoanalysis and Psychotherapy, edited by Lori C. Bohm, Ph.D. and Rebecca C. Curtis, Ph.D., with Brent Willock, Ph.D. has been awarded the Goethe Award for Psychoanalytic & Psychodynamic Scholarship for 2009. In 1930, Freud was awarded the ‘Goethe Prize’ for his literary and recognized scientific achievements. The Goethe Award for Psychoanalytic & Psychodynamic Scholarship is given by the Canadian Psychological Association’s (CPA) Section on Psychoanalytic and Psychodynamic Psychology for the best psychoanalytic/psychodynamic book written each year. This award considers any disciplinary or interdisciplinary subject matter in theoretical, clinical, or applied psychoanalysis or psychodynamic psychology and is judged on the basis of providing an outstanding contribution to the field. A selection committee reads and reviews each nominated book and chooses a winner. 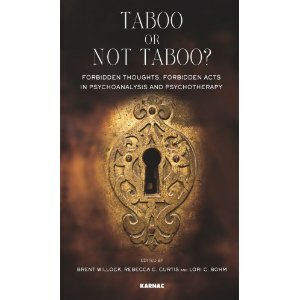 Taboo or Not Taboo contains chapters written by White Institute members Mark Borg, Ph.D., Emily Garrod, Ph.D., Daniel Gensler, Ph.D., Anton Hart, Ph.D., Jill Howard, Ph.D., Jennifer McCarroll, Ph.D., and Janet Tintner, Psy.D., in addition to the chapters contributed by Drs. Bohm and Curtis.